36″ x 48″- 91 x 122 cm, oil paint on linen.It is never to late to find your destination and go after it. I started my life in a small village in the South of the Netherlands surrounded by water. Sailing was what alleviated the difficulties of hay fever. While moving ever further on to the sea, I became excited about the feeling of limitlessness I saw, being on a vast body of water. The sense of freedom appealed to me and made me happy. I hoped to make a living at sea but as a woman with poor eyesight, the odds were against me. I decided to try and earn a living as graphic designer and then buy a boat. Working at big companies as an art director was not as satisfying as I thought it would be. The weekends were spent racing across the English channel as crew on various sailboats. Sometimes I went further away and one day in 1985 I saw the most beautiful boat I had ever seen. 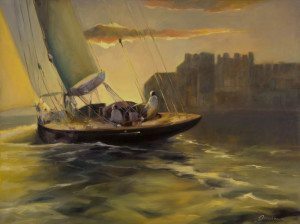 A sophisticated, elegant, beautiful vessel called Velsheda was participating in a race off the coast of St Malo. My dream was to sail a boat like that but it seemed impossible. This was only for very rich people. I promised myself to work harder, to make a career and hopefully to get lucky one day, but the dream vanished behind the desk of the office where I had buried myself in work, not realizing I was bored to tears, in the “exciting” world of advertising. When the opportunity came to sail on a windjammer from London to Amsterdam in the Tall ships race, I boarded the Belem. This event provoked in me a deep desire for freedom and adventure. I quit my job and moved to the Caribbean. I couldn’t imagine spending my days in the grayness of an unsatisfactory life. It became a long journey into the unknown. To survive in a strange environment I started decorative painting for people and from there I was asked to paint murals. This led to painting canvasses. I don’t think I ever called myself an artist, nor was there a conscious decision to do so. After some painful events in my life, I used the reflection of the images I painted as a way of healing myself and thus the world. It was cathartic and good. One day, after I painted a large abstract painting inspired by a white Bird of Paradise, I saw the image of the Velsheda again, that day in St Malo. 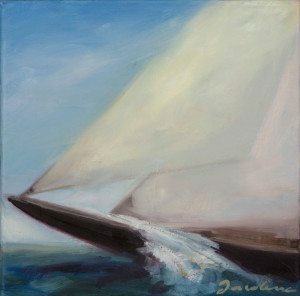 A voice asked me, “What do you really want to paint?” I knew the answer; sailing boats, and especially the J-class. By now the dream of ever being part of sailing the so-called “Greyhounds of the Sea” seemed beyond reach. Painting however was part of my daily life and it allowed me to draw the sailing world into mine. The imagination is a powerful tool. It lifted me up from an undesirable reality to a new world of limitless possibilities. I painted my dream. I knew I had created the world I live in today and I am taking full responsibility for it. By doing that, I know that I am in control of the rest of my life and I can create anything I want, just like I do as an artist. I can bring every image alive on the canvas, in my imagination and thus in my reality. The picture here shows a person at the helm of a beautiful boat, fully in control of his destiny. The fact that the sun is setting at the end of a long day does not bother him. It is the powerful feeling of moving toward the ever-expanding horizon. It is a happy feeling of moving towards infinite possibilities. Why is he such an inspiring figure to me? We have nothing in common but our name. My name is Jacobina Trump. This never was a problem in the past, but lately as you can imagine, the reactions of people to my last name have changed. Ten years ago, when I was still married, I used to answer the question “Any kin?” with, “Oh no, I married the right one.” Alas, those days are gone. I thought about changing my name, but my original family name has a difficult pronunciation in America and I had already established a website for my art. My last name is powerful. Not too long ago when the access to a private island was temporary closed due to construction, the guard said to me, “If your name was Trump I would let you through.” I laughed and said, ”Let me show you my driver’s license.” These days when almost everybody has something to say about Trump I hear many jokes and comments about my last name. a playing card which is elevated above its normal rank in trick-taking games. Typically an entire suit is nominated as a trump suit – these cards then outrank all cards of plain (non-trump) suits. In other contexts, the term trump card can refer to any sort of action, authority, or policy which automatically prevails over all others. I am an American citizen and I am determined to build a fulfilled life in freedom with a bank account that, one day, might trump Trump’s. Donald Trump has no more rights than I have except that he was born here and can become a president. That is something I do not aspire to. The word “trump” derives from “trionfi” or “triumph”. The tarot deck contains a fifth suit, known in gaming as the a-touts or honors and in occult circles as the Major Arcana, which serves as a permanent trump suit in games played with the tarot deck. The suit consists of 22 cards, including a Fool which serves as a highest trump (in Central Europe) or excuses the players from following suit elsewhere. The Fool is the highest Trump? …now that is interesting news. Growth can happen in strange ways. I was painting White Birds of Paradise en plein air. I packed my wooden paint box, easel and survival equipment in a backpack and looked for a natural setting to paint my desired object. Now it’s getting a little hot outside, but for a while the weather was ideal to do this. I feel that painting outdoors is very spiritual, as the ceiling of the universe gives a feeling of limitless possibilities. Mostly when I go home after such sessions I am tired but I also am fulfilled, as if somebody gave me a precious gift. I chose the White Birds of Paradise from my subconscious mind as it goes with most subjects. The events that followed were probably also designed by my subconscious mind because they surprised me. I found the flower cut off when I went a third time to capture it in oil paint. To me this was a sign that I needed to go to the studio, stay inside and paint more loose and colorful variations, especially after a client said she’d like to see this style of painting. I made a series of large semi-abstract paintings, not knowing where I was going with the idea, but enjoying it. Somebody told me that this was the kind of work that could get me into galleries and I wanted to get into a gallery to sell my work. With high expectations of some success in this direction I called photographer Heidemarie Burke who documents all my work. I decided to get the pictures, put them in a magazine and spread the word about this new and exciting course of events. The next day I started painting sailboats and I haven’t stopped since. All the rejections from potential buyers, jobs and other forms of income made sense to me now. When doors keep closing, there is a reason. All these failings are telling me I am supposed to paint sailboats. My world immediately expanded, because this is a niche that not only has defined buyers, it has universal wisdom, romance and beauty. There are galleries devoted to this subject and I can talk easily with potential buyers about my experiences at sea. When I was young I photographed offshore races for major magazines. I am familiar with classic sailing destinations like St Malo or the Azores. It felt like a bridge between where I am and the world I feel I belong to. I am combining the art world with the world of high class adventurers. It may sound easy and logical, but this caused a deep personal crisis. I realized that in my search to find my niche I was trying to be someone I wasn’t. There were legitimate reasons why I always had rejected the idea of being a marine painter. I thought it would be boring to work from photographs, copyrights would cause trouble and there is a lot of competition. 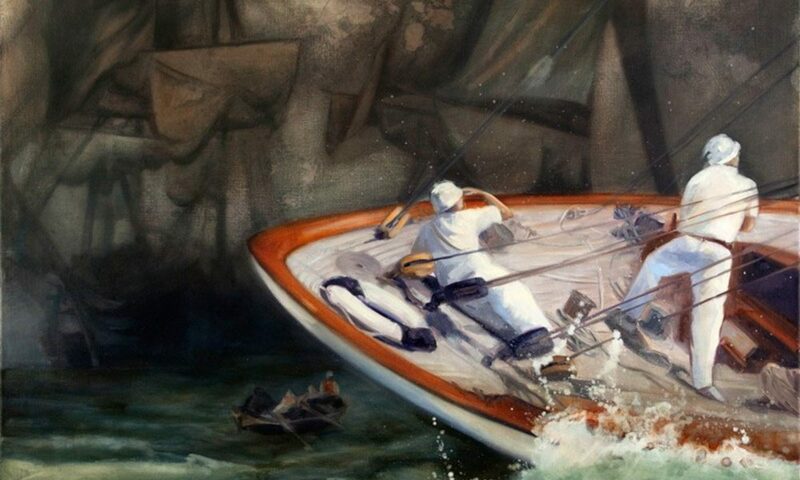 Many talented painters dedicated their whole life to marine painting. And yet, I believe I can express my own unique style painting this subject. It’s expansion and I’m excited. Where is the Michelangelo of our time? I am following artists online who design programs for other artists on how to become wealthy. One is called The Abundant Artist. While I am watching this I think, really? There are many different ways to get attention. You can write, you can scream, you can socialize, you can laugh at everything and you can also say… I can imagine. I started painting The Dream Weaver in Indianapolis. It was winter and every week I would haul a carload full of wood for my fireplace to keep me warm. I would grill steaks digging a path through the snow to my Weber, sometimes hip-deep. You think -20 is only a number until you have lived it. I was also trying to figure out what the role of an artist was for myself, and in general. It was not only about me. My question was, how can I enrich the world with the richness I feel inside? Does anybody want this beautiful world? I studied great artists from long ago and from today and everywhere I found that they were rich inside, even if financially challenged. Sure, there are some artists who make it big in the world by giving the public whatever they want. Some were great at marketing. Why do you think copying Mickey Mouse paintings sell for millions? Watching this made my stomach churn. An artist who copies another artist just to make money loses their integrity. Walt Disney invented the strip characters. Greatness does not flourish in copying a master. Greatness flourishes in imagining your own next step. The world needs authentic thinkers. Therefore to follow a person who tells you what steps to follow so you yourself can become rich and famous is ludicrous. It is already done. Of course there are skills we artists need to learn. Marketing skills, technical skills – we all learn from the ones who were before us. That is a universal law. The Dream Weaver is about a person weaving the dream of the tropics. I was in the Stutz Building in DownTown Indianapolis on snowy nights with the orange light shining through the ice on the windows. I was painting my dream. Now I live in the subtropics and I love it. This is where I want to be. I don’t really know how I got here. (I think I drove a Penske truck.) But it doesn’t matter as this is how imagination works. You visualize, you paint and the next thing you know you live it. This is how the artists of the Old World painted their vision of an airplane, of a canon, of a ship. They visualized it and then they built it on canvas and paper. The power of an artist is unbelievable. I teach basic drawing skills only. By learning to draw you tap into the right side of the brain and you stimulate creativity.You don’t have to become an artist. Our society is focused on using the left side of the brain. I don’t believe this linear thinking can solve the problems we face today. The situation in the world is almost unbearable for me to watch. The destruction caused by this kind of thinking is devastating. You don’t need to splash paint around to start thinking from the right side of the brain. Drawing triggers the imagination.That is all and it is powerful. Where is the Michelangelo of our time? Where is the artist who is strong enough to stand up and create a different reality? It never is about growing polarity in politics. Creating a good life is not about politics. It is about who can create a satisfying reality for the inhabitants of planet Earth. It is the Great Master of our time who is making the path of the independent thinker who takes risks instead of trying to stay safe at a cost to others. Hundreds of years later the drawing of the Flying Machine was picked up by the Warner Brothers, who were stimulated by the imagination of it.